For more than a decade, Harding Steel has teamed up with creative building design teams to craft custom lifts for moving vehicles from lower to upper levels in situations where elevator shafts, and other lift types will not do the job. 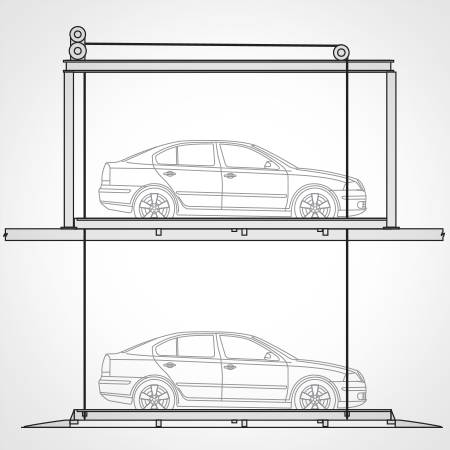 Harding Steel’s Mezzanine lifts are custom designed, single platforms systems that transport vehicle between two levels. The concept is to “drop” a platform out of an upper level floor or mezzanine to a lower level showroom, service centers, or storage area. There are no vertical posts, lifting mechanisms, columns, or shaft walls on the lower level that obstruct views or limit the use of valuable floor space. These systems are space-efficient, economical, and visually dramatic. Harding Steel has installed Mezzanine lifts in auto retail showrooms, motorcycle dealerships, auto museums, race car facilities, and even “rampless” parking garages.